People around the world need to learn that it is Qur’an dogma that infects Muslims to become bigoted, hate people of other religious beliefs, and will kill those who will not accept Allah. As throughout the past, we witness today the intolerance, violence, death and discontent Islamic beliefs have caused in many countries. The Qur’an is the root and source of Islamic terrorism, and discontent throughout the world. >> The Qur’an 9:33 proclaims Islam will prevail over all other religions. No other religion makes such a claim (Allah, We, Our and Us, 1.1). Comments are welcomed on www.nicholasginex.com. Muslim religious leaders and others who disagree with the conclusions in this article or content in the book, Allah, We, Our and Us, are welcomed to write their reasons in the comment section below. Allah, We, Our and Us published 2014. First, I wanted to correct the major theme of your article; that the overall message of the Qur’an teaches bigotry, hatred of other beliefs, and the idea that those who don’t embrace Islam should be killed. This is not the message I embraced Islam upon, nor is it one I’ve found consistent with the Qur’anic message in my studies. The Qur’an needs no revision, only the current thought concerning it’s message and theology, I agree with you that there are Muslims who abuse this religion – just as there are Christians, Jews and Buddhist (and other religious adherents) that have abused the high and noble ethics of theirs. The Qur’an, like the Bible and other religious texts, isn’t a book we should read lightly, and then engage in debates over it’s ambiguous verses. This is the work of scholars, and no realm for the layman. As a student of knowledge, and not yet a scholar; I have no theological comment concerning subjects you mentioned. For example, abrogation of certain verses, etc. I’m not worthy of that honor. I will say you could benefit more in your examination of Islam by relying on more authentic, and scholarly research. You have one good source I saw, but the rest; in my opinion are garbage and only serve to create animosity towards a beautiful, yet misunderstood religion. Biased stereotypes do little good for anyone. Thank you for your response to the article, END Islamic Terrorism. I have much respect for your effort to reach out to me and present your views about the article. You are partly correct. Yes, the Qur’an has many, many passages that incite bigotry, hate for those with other religious beliefs, and will cause violence and murder of those that do that follow Islam. 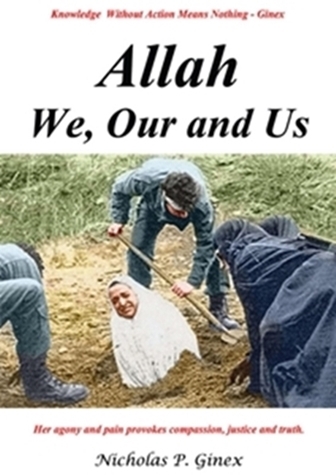 This is well documented in the novel, Allah, We, Our and Us, and may be read as a “Free” read by clicking on the link, http://iranpoliticsclub.net/library/english-library/allah-we/index.htm. However, you indicated that the message you embraced is not what my article presents, “nor is it consistent with what you have learned in your Qur’anic studies.” Of course, you realize that Islamic religious teachers will not provide the factual history of how Islam became a theocratic empire in 750 CE after the death of Muhammad in 632 CE. Nor will they indicate those passages in the Qur’an that instill bigotry, hate, violence and murder of infidels. My dear friend, you have been indoctrinated well to become a loyal Muslim. You owe it to yourself to read the Qur’an line-by-line from one of the first translations by Muhammad Zafrulla Khan. He became the President of the 17th Session of the UN General Assembly, Judge of the International Court of Justice at The Hague, of which court he became President. Mr. Ahmad Jenkins, do not sell yourself short of not having the intelligence and capability to read and comprehend written text in Scripture. What makes a scholar is the ability to read, analyze, dissect, and interpret the written word in an honest and objective way. All my life I have been concerned about the lies and myths that are fed to unsuspecting minds that make people slaves to a particular theology or idea. I am an educated man of 81 years of age and it is my mission to inform others what I have learned in life. I do not like being made a fool of and more importantly, I will not stand by and let my fellow brothers and sisters be made into fools. Yes, there is much to learn from Scripture but there are many passages that are corrupt because they were written by men not God. You have much to learn in life. Do you have the fortitude and humility to take the time to read what many of our great scholars have written about the various Scriptures? I have invested much of my life to learn facts that a religious teacher will not speak of to others. I hope you are intelligent enough to question and critique the written word whether or not it is a Holy Book. Surely, if God inspired the words in Scripture, all people should easily read and understand the words of God. It is only Holy men who want to keep you enslaved with a particular ideology that advance the idea that only scholars and highly trained religious leaders are equipped with the brains to understand Scripture. I hope you are not dumb enough to accept that baloney. Ahmad, I offered the following invitation to Muslim religious leaders in my Press Release, http://wh07.droa.com/~c2035781/2016/08/19/end-islamic-terrorism/. Ahmad, you are, thus far, the only Muslim who has responded to this article. It means you are open to discuss and perhaps increase your knowledge about not only Islamic but also, Christian and Judaic Scripture. As you may have learned, I have read the Scriptures of these religions and with my education, perception, logical mind, and desire to unveil facts that provide an honest appraisal, I have taken the time to share what I have learned with others. If Muslim Scholars and Islamic religious leaders disagree with what I have written on this post they are welcomed to state their reasons or comments in writing. If they do not, then it is clear that the conclusions in this post are accurate and valid. Ahmad, please show where in this post you are able to show my facts and logic may be classified as garbage. It is not my intent to create animosity towards the Muslim people but only to illustrate that though they believe the Qur’an is a beautiful, misunderstood religion, it is in fact, the source of discontent, violence and death. Good, peaceful Muslims far outnumber the fanatic Islamic terrorists and yet they let them continue to dominate other religions by acts of terror. Is it because all Muslims are indoctrinated with the same Scripture, the Qur’an, and inherently have the same views? I appreciate your comments. Please share my articles with many of your friends. Next Next post: Dialogs on Does Consciousness Pervade the Universe?